Specific instructions for fine-tuning your Windows operating system so it works best for you. A library of freeware and shareware programs that allow you to operate more efficiently—and advice on which applications to avoid at any price. An insider's guide to computer-assisted translation tools—what they are and how they can work for you. How to translate complex file formats, including XML, help systems, desktop publishing formats, PDFs, software development formats, and multimedia and audiovisual materials. Detailed assessments of quality assurance procedures and the latest generation of translation environment tools. All you need to know to guard yourself against spam, viruses, phishing, and the many other Internet threats. Information on standalone terminology tools, alignment, translation memory maintenance, and dealing with graphics. Using machine translation in translation environments. How do approach audiovisual translation. 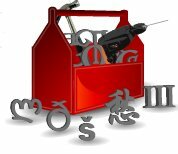 The Translator's Tool Box has long become the go-to reference for translation professionals everywhere and is widely used in university courses around the world. This completely overhauled and expanded 480+-page edition provides you with a wide array of additional practical tips on how to make your computer the productivity tool it ought to be. To see for yourself, please click here to view the table of contents and the comprehensive index. The download for version 13.5 contains a parallel PDF and an HTML5 help system so you can use the materials the way you prefer. Its cost of $50 will be quickly offset by the savings you'll begin experiencing immediately as you put its suggestions to use in streamlining your translation work. If you've already purchased earlier editions of Translator's Tool Box, you may upgrade to the new edition for only $25. Every owner of the Translator's Tool Box will automatically receive an annual subscription to the Tool Box Journal and access to the archives of the Journal. You can pay with a PayPal account. If you do not have a PayPal account, you can also pay with a credit card (Visa, MasterCard, AmEx, or Discover) through the PayPal website. For both options, enter the amount in the provided space (add $10 if you would like the Tool Box shipped on a CD), click on the button, and follow the instructions on the PayPal website. If the PayPal service is not available in your area, please contact me directly. Exclusive offer for ATA members: If you are a member of the American Translators Association, you can purchase the book for only $30 (just enter the correct amount in the field below and let me know that you are a fellow ATA member)! For corrections and additions to earlier versions of the Tool Box, please click here.